Given these guidelines, I designed three brief worship services. Just like aerobics classes has high-impact, medium-impact, and low-impact, these three services are rated in a similar way. This worship is designed for those who want to do something creative and crafty, as well as have basic technological skill. It will require a little more work on your part and bringing some materials with you. Within this worship service, committee members will have an opportunity to introduce themselves as well as create “Community Covenant” Christ candle that can be lit during the whole time the committee deliberates. Worship is done on prezi. It is a free online resource and can be downloaded onto a computer or USB device. Large candles can be inexpensively bought at IKEA. 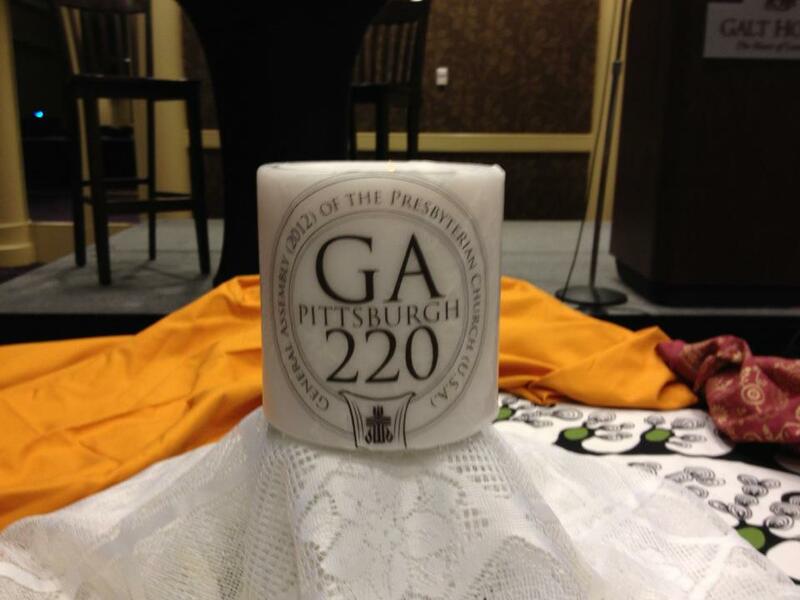 To imprint the GA 220 logo onto the candle, follow these directions. Stockmar decorating wax sheets can be bought online at http://www.atoygarden.com All songs are from the Hymnal Sampler, which contains the songs that will be in the new Presbyterian Hymnal. Call to Worship is written by the Rev. Kaji R. Spellman in “The Delightful Lightness of Being in Light: Service Prayers with Holy Communion for the Fifth Sunday after Epiphany.” Posted on the United Church of Christ’s Worship Ways website. Confessions & Assurance is written by Thom Shuman. Posted on Lectionary Liturgies blog. You Tube video is the song “Run” by After the Chase. One: Good people of the church, Lift up your eyes and see. All: Have you not seen? Have you not heard? Our God greets us here. One: Good servants of the Most High, Open your ears to hear. All: Have you not seen? Have you not heard? Our God meets us here. One: Good children of the light Open your hearts and know what it means to delight in God. All: For we have seen, heard and known From the beginning to the end, Our God…is. Rushed by the busyness of life, weary from the stress of everyday, we have these moments to catch our breath, to think of how we have treated others recently, to remember how we have not been God’s faithful people. Let us come to God, knowing that the One who listens to our words, is the One who has given us the Word of grace and mercy. Everlasting God, we know how easy it is to forget your presence and power in our lives. Focused on our daily planners, we do not pay attention to the night sky and the stars that glitter. Surrounded by the sounds of anger, violence, and hate, we have trouble listening to your whispers of hope and grace. Thinking that Scripture is filled only with stories, we cannot understand your truth, which can change lives. Forgive us. There is no one who can hold a candle to you when it comes to mercy and hope. Lift us to our feet so we may walk with you; fill us with your strength so we may serve your people; touch us with your healing so we may proclaim to everyone the Good News that has come in Jesus Christ, our Lord and Savior. Haven’t you been listening? The Good News is this: God never tires out, God is always with us, God heals us with mercy, God strengthens us for service. The One who numbers the stars knows each of us by name. Thanks be to God, we are forgiven. Amen. Take a moment to think about the work of your committee. phrase, or symbol on the wax strip as a covenant of hope to the group. This worship is more middle of the road with an interactive element that doesn’t require that much skill. It will require preparing and bringing some materials with you. Within this worship service, committee members will have an opportunity to write their own assurance of pardon of God’s grace and forgiveness and share that with others. All songs can be found in the Hymnal Sampler. Call to Worship is written by Rev. Andy James, Pastor, First Presbyterian Church, Whitestone, New York. Posted on the liturgylink website. Confession and Assurance is written by Moira Laidlaw, and posted on the Liturgies Online website. Hang vertically off the table 2” wide ribbon, securing the ends to the table or whatever structure. Photos will have to be color copied and cut in advance. You can use paper clips or clothes pins which can be ordered in bulk at Oriental Trading Company. God created all things and summons everyone by name. No one – nothing – can compare to God’s glory. DDon’t you know? Haven’t you heard? The Lord is the everlasting God, the creator of the ends of the earth, and never grows tired or weary. Those who hope in the Lord will renew their strength forever and ever. Merciful God, the words in Isaiah about not knowing you, and not hearing about you, resonate within us as we link them with the words of Paul—“woe to me if I do not proclaim the gospel!” We know that one of the greatest challenges today is to communicate the gospel so that people really hear it. Yet so often our persistence in clinging to old and familiar traditions, practices, and language, block people from hearing and experiencing the good news of Jesus Christ. Woe to us all if we persist in proclaiming the gospel in words and ways, which put people down rather than build them up. Forgive us, O God, for clinging to the use of language, which excludes people from hearing the great good news about Jesus. Woe to us all if our lives and characters proclaim other than the gospel of Jesus Christ. Forgive us, O God, for the times when our piety is visible on Sundays, but hard to detect the rest of the week. Woe to us all if the gospel is proclaimed only within these walls and not daily in the communities where we live or study or work. Forgive us, O God, for earnestly praising and worshipping you in words and ritual, whilst ducking for cover when it comes to performing deeds of mercy and service. Woe to us all if we forget that proclamation of the gospel goes hand in hand with the belief that the hopes and dreams of the downtrodden and powerless can be transformed into reality when we risk stepping out in faith. Forgive us, O God, if our zeal for mission and evangelism is shaped by the state of our finances rather than the promptings of the Holy Spirit. Hear the good news: Anyone who is in Christ is a new creation. The old life is gone; a new life has begun. (based on 2 Cor 5: 17) Friends, believe the gospel: In Jesus Christ we are forgiven! 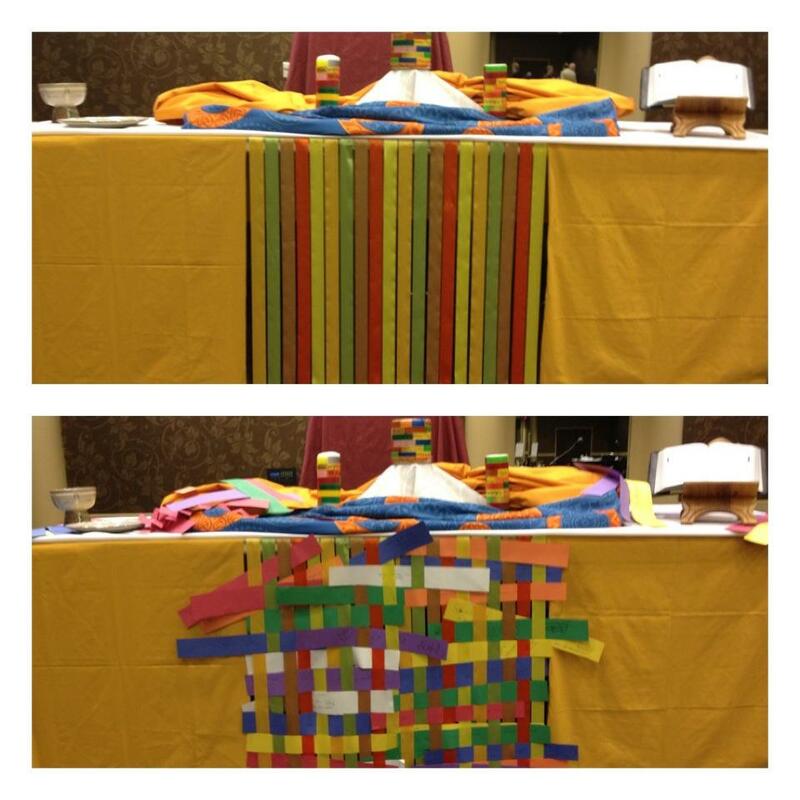 When you are finished, clip the photo that represents what you bring to the prayer loom. Place the photo that represents what you hope for in the basket. As the basket is being passed around, please take a postcard with someone else’s hope. Keep it throughout the week as a reminder to you of our collective hope to faithfully do the work God calls us to do. This worship is simple. It requires minimal preparation and most materials can be found on site. Within this worship service, committee members will have an opportunity to create a prayer loom that will act as a table covering filled with words and prayers from Isaiah 40. 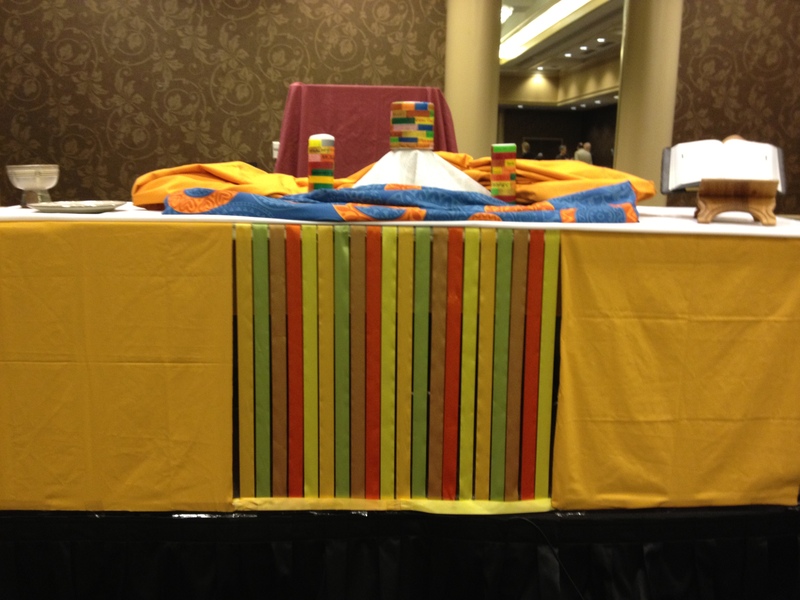 The table covering can remain displayed through the work of the committee as a reminder of their communal prayer. All songs are from the Hymnal Sampler. Call to Worship is written by Mary J. Scifres. Posted on the Ministry Matters website. Confession & Assurance is written by J. Puls, G. Cashmore. Posted on A.E. Hunt Progressive website. Prayer is written by Rev. Scott Cervas, Meadowthorpe Presbyterian Church, Lexington, KY. Posted on the liturgylink website. Line the table with newsprint or butcher paper so that the paper overhangs the side of the table. Hang vertically off the table 2” wide ribbon, securing the ends at the end of the paper so that you are creating a loom. Cut out 2×14” strips of paper. One for each participant. Gather us in, the brokenhearted and the joyful. Gather us in, the weak and the strong. Gather us in, the fearful and the brave. us in, the young and the old. Gather us in, to sing of God’s works. Gather us in, to praise Jesus Christ. Gather us in, to worship and wonder. us in, to know of God’s love. God of surprises you call us from the narrowness of our traditions to new ways of being church, from the captivities of our culture to creative witness for justice, from the smallness of our horizons to the bigness of your vision. Clear the way in us, your people, that we might call others to freedom and renewed faith. Jesus, wounded healer, you call us from preoccupation with our own histories and hurts to daily tasks of peacemaking, from privilege to pilgrimage, from insularity to inclusive community. Clear the way in us, your people, that we might call others to wholeness and integrity. Holy, transforming Spirit, you call us from fear to faithfulness, from clutter to clarity, from a desire to control to deeper trust, from the refusal to love to a readiness to risk. Clear the way in us, your people, that we might all know the beauty and power and danger of the gospel. Sharing wisdom of the people. God of our deepest strength, as we breathe in the words of ancient poets and prophets, as we inhale the words of 1st century storytellers, refresh our hearts and minds so we might hear these words in new ways… so we might struggle with those words long enough to understand them… so we might be renewed to go and be and do… Amen. You are invited to come forward and weave your strip of paper on the ribbon loom which will be a table cover as a visual reminder of the communal wisdom spoken. 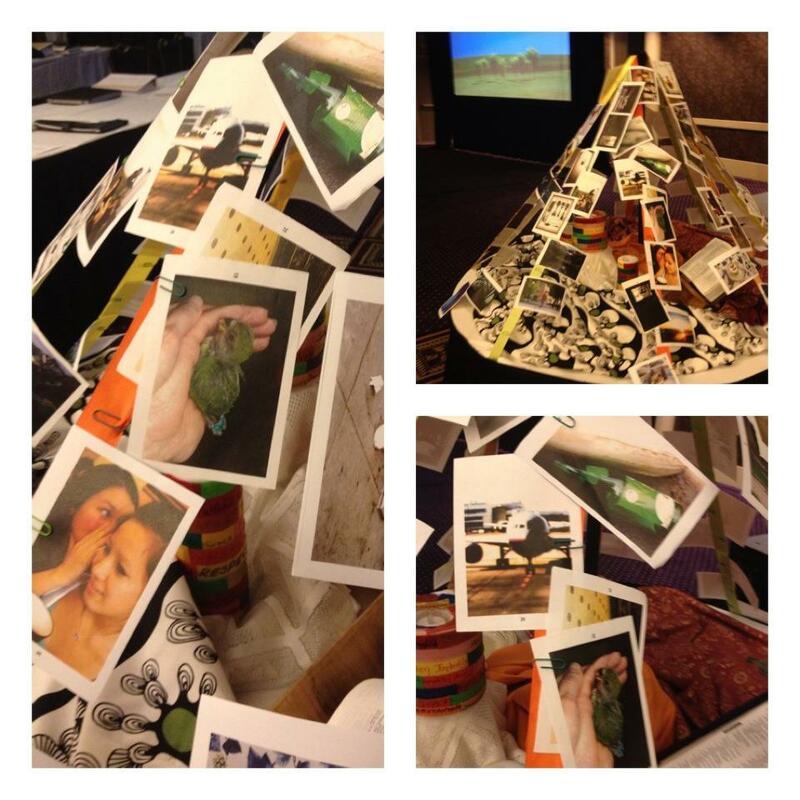 Very nice, Theresa – thank you for sharing these ideas! I was so sorry not to have been with you, Theresa!